I have been ridiculed by many for uttering ABC's, 123's, shapes and colors to my baby who is a year old now. But that hasn't stopped me from doing what I consider right for her. I have rather felt that those who are uttering "la lal la", "ba ba ba" and switch on TV for engaging their babies are wasting those crucial months and years. Brain begins to develop as soon as the baby is born and it is like a sponge or box. An empty one. It is upto us, what we want to fill in and make the baby experience and learn. Without getting into the specifics of what exactly my baby is grasping and what is age-appropriate, I started narrating alphabets, numbers and other things to her as early as 3 months of age. Not necessarily I would make her sit and see books, but just moments like patting her to sleep, walking in parks, feeding her, would be our learning sessions. I and my husband made some placards at home that depicted numbers and dots. This was inspired from the works of Glenn Doman. In my quest to gather knowledge about cognitive skills in babies, I read books on it. My favorites has been How to Teach Your baby To Read and How to Multiply Your Baby's Intelligence by Glenn Doman. According to Doman's philosophy, children love to learn and know new things. And, in a simply way we can teach them a lot. Maths is one such easy skill that can be taught to develop "thinking" in your baby by using symbols. At 5 months, my baby was getting a regular dose of these placards flashed before her. And, in just a few days, she began to recognize them and the sounds of 123's. 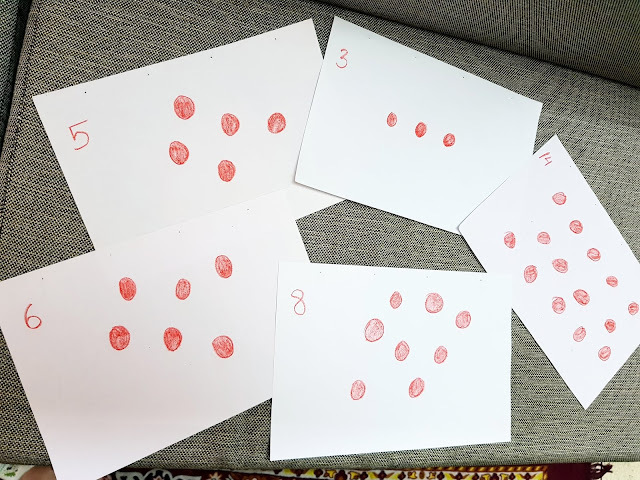 Every time I showed the placards, she would be very excited and gaze at the red dots. When Daisy was 8 Months, I bought her building blocks. She did not know what to do with them or how to insert the blocks into their correct shape holes. Nevertheless, she loved throwing them, and sometimes put them on top of the other. 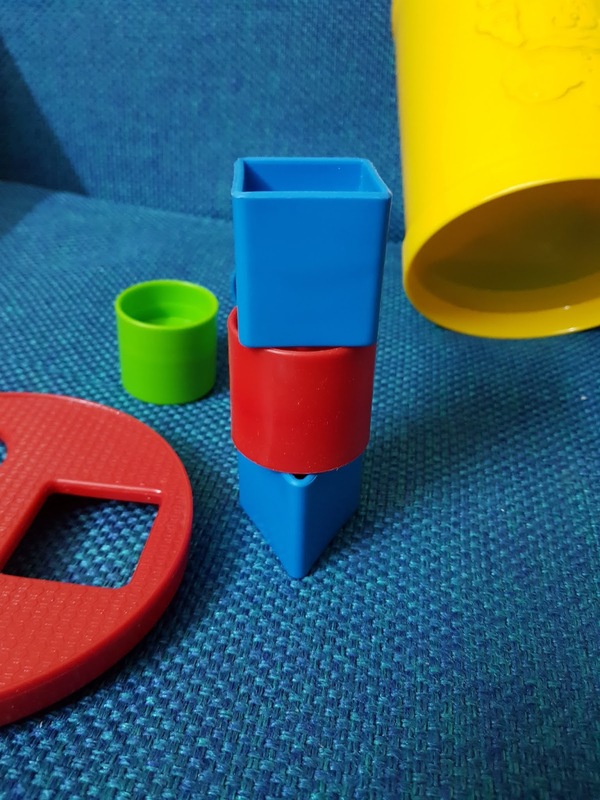 The product itself is very good, the blocks are in bright colors so baby gets attracted to them. 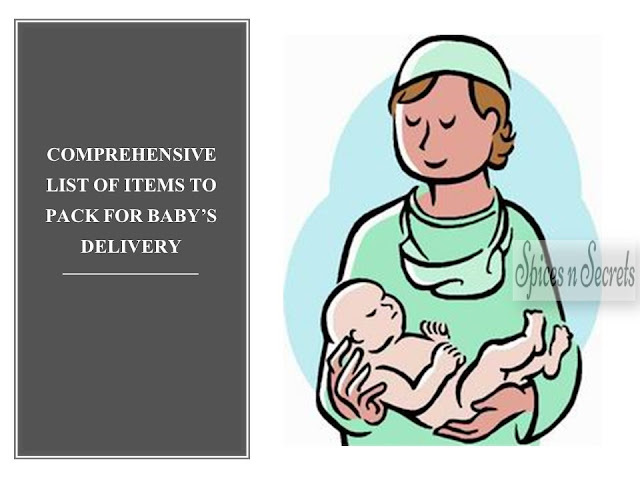 Blocks are quite big, so there is no chance of baby swallowing and choking. 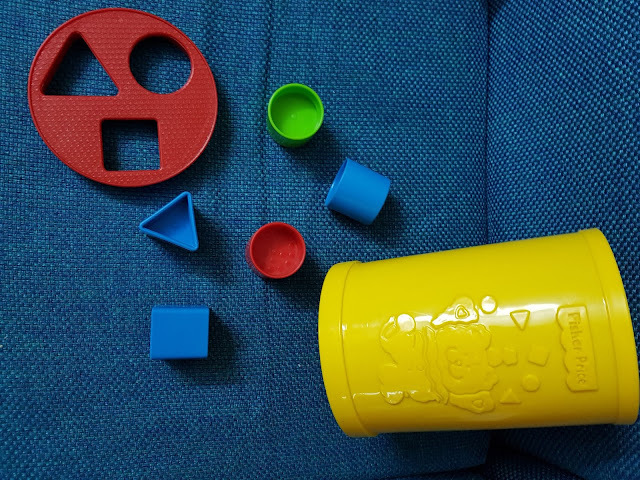 The edges of all the items in the play kit are round and smooth. 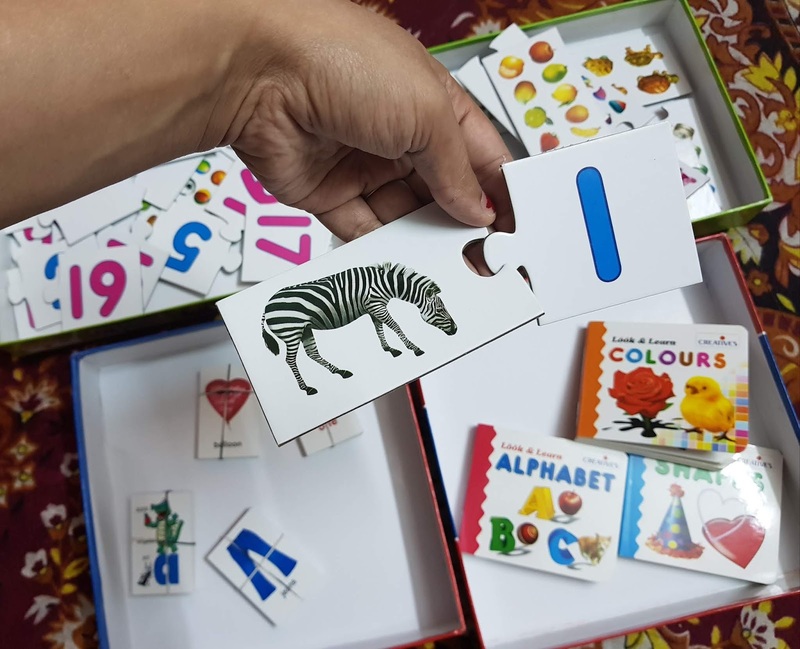 Looking at the choices I have made for my baby and respecting my decision to educate her from a very young age, my cousin gifted my baby on her first birthday a variety of educational items like alphabets, shapes, colors and numbers. 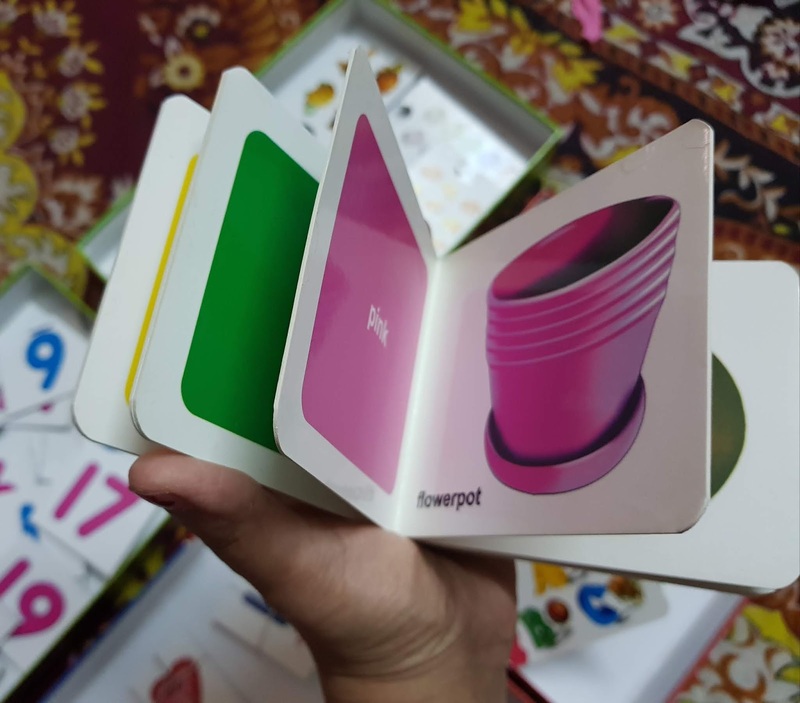 What's beautiful is the different ways in which they can be used for learning, such as, memory games and co-relations. In terms of safety, the fear of paper cuts are very minimum because the letters and alphabets are printed on thick cardboard pieces with smooth rounded edges. 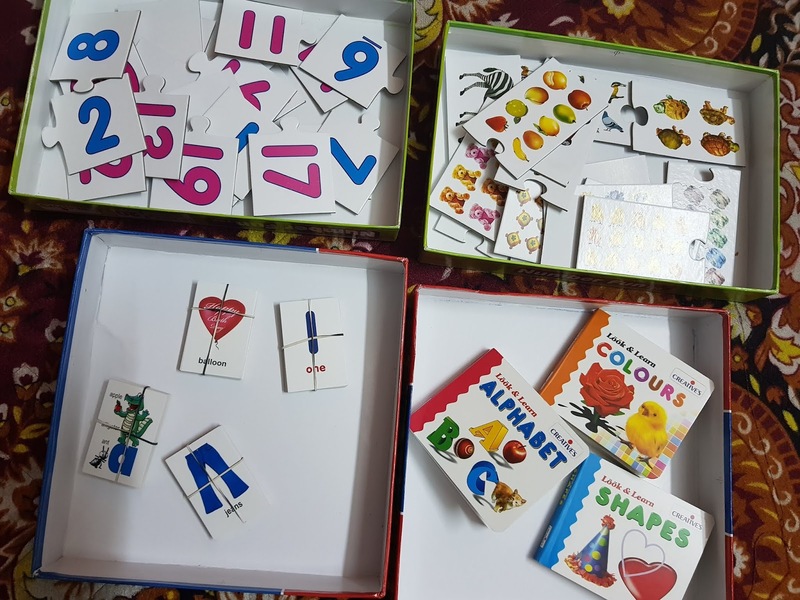 If it wasn't for her, I would have self bought it anyways, as I am always in search of such educational games and items that are non-electronic. 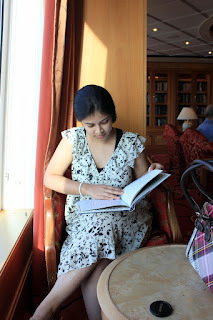 I do not have any hatred towards technology, but knowing that we are in the age of hi-tech gadgets, I do want to take some efforts in keeping her away from them and not have complete dependence on them. 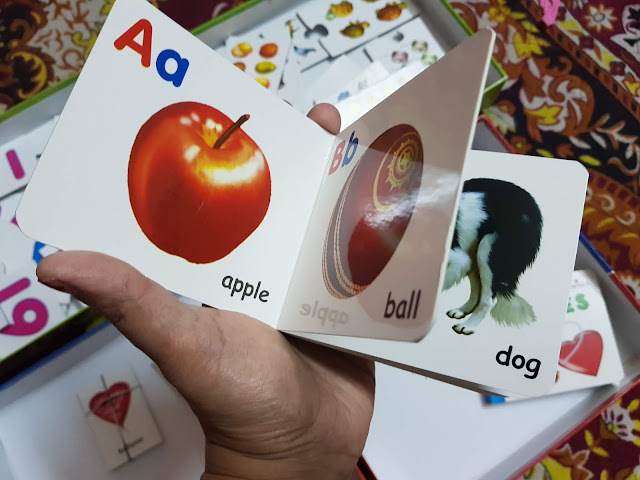 ABC's can be learned from YouTube as well, but I do want to spend money and buy books that she can hold and feel and then learn ABC's. Music and sounds can be easily heard in television and mobile phones, but I wanted her to self learn through a Xylophone. We particularly chose this variant of musical instrument because it is inexpensive, non-electronic, doesn't use batteries, the parts are well-fixed and its unbreakable. The sound is soothing to ears and never has my baby or her friends disliked playing it. 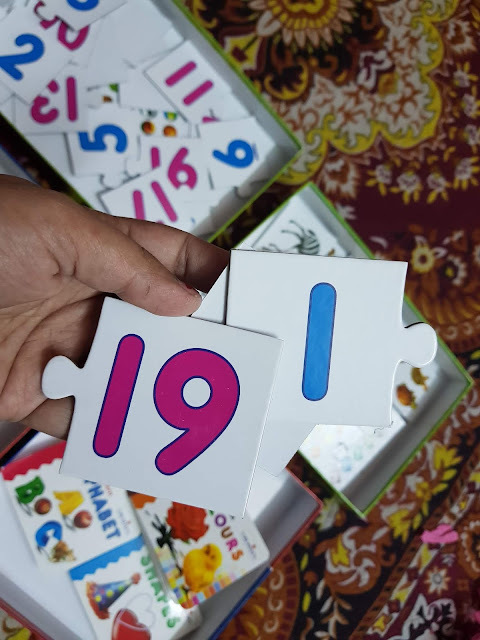 Thus, parents and guardians have a crucial role to play in gifting their kids the right games and toys that spark curiosity. Learning is a gradual process and when to start is completely dependent upon parents and guardian's decision. In India, pre-school starts at the age of 2.5 years. Some unwilling families begin pre-school and school much later, thinking that it will put pressure on kid's minds and they are not ready for hard mental work. I, however, do not support this thinking. We cannot assess the development of the brain just as we can see the development of bones and muscles through height and weight gain, but the brain is definitely grasping and creating memories. Or how else would you explain, a baby looking up and smiling at the sound of a lullaby that he/she has repeated heard? This act shows that the baby is recalling something familiar and some neuron connections are making her laugh or afraid. For example, my baby has always cried at the loud sound of a mixer-grinder. And, now even if I do not start the machine, the sight of that white mixer jar, makes her afraid and cry. These toys lay around her always and there is absolutely no time or schedule attached to learning sessions. Whatever she is picking and touching are all contributing to learning all throughout the day.